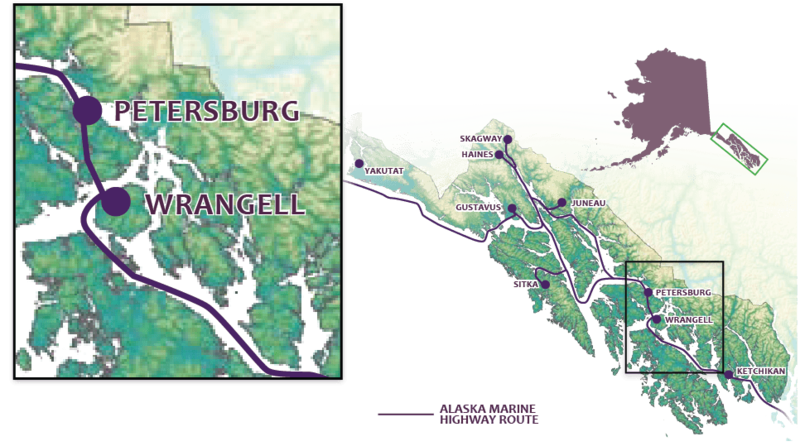 The two most visited glaciers in the Wrangell area include Chief Shakes Glacier and LeConte Glacier, the southernmost tidewater glacier in North America. Both glaciers, along with dozens of others, are part of the Stikine Icefelds located in the Stikine/LeConte Wilderness of the Tongass National Forest and the Stikine Wilderness of British Columbia, Canada. Shakes Glacier, located on the Stikine River, is in a narrow fjord known as Shakes Lake. The glacier is actively calving and a boat or flightseeing excursion offers an awe inspiring view of a 20-story-tall wall of ice. The LeConte Glacier north of Shakes Glacier is one finger of the massive Stikine Icefields and is in constant motion, with huge chunks of ice breaking off into the channel. There’s a reason why the Natives called this “Thunder Bay”—the glacier is never quiet.